On September 1, 2016 I pre-ordered the collector’s edition of Persona 5. I can’t remember why I did that then several months after it had been announced and several more before it would finally be released. But I did. It cost me $76.31 with tax. Yesterday I unearthed the remnants of it from my closet, turning them over in my hand like ancient artifacts, wondering why on earth I’d wasted money on them. Despite buying hundreds of games during my life, I’ve only splurged on a handful of collector’s editions. Usually they’re Japanese role-playing games. Partly that’s because I believe they will hold their value and so I can eventually resell them, making the damage to my bank account minimal. It’s also partly an attempt to psyche myself up for a game. JRPGS used to be my favorite type of game. Their effect on me was magical, the experiences they left me with transcendent. I want to experience that again. So occasionally I drop an extra $20, $30, or even $40 on the ingredients I think will help grease the wheels of my imagination to send me back to that wondrous place. I’ve yet to find a collector’s edition that is worth it. Atlus announced Persona 5’s Take Your Heart collector’s edition during E3 2016. 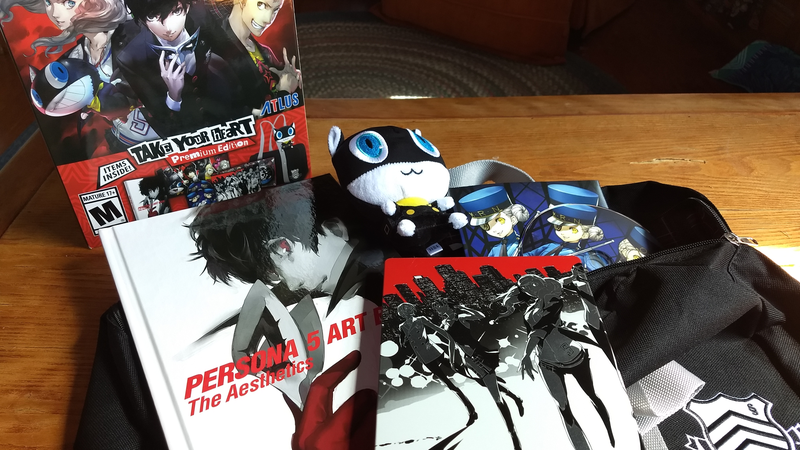 The $90 package would include a 4” toy version of Morgan, the game’s talking cat, as well as a 64-page hardcover art book, a “full-size” replica school bag for Shujin Academy where the characters undergo their studies, the soundtrack on a CD, and a collectible box. It would also include the game, of course. Instead of being inside a normal plastic PS4 case it would arrive inside a SteelBook case, an object whose unusual capitalizations owe to the fact that it’s also the name of the company that produces the bulk of all brushed metal collector’s edition cases. “Featuring the Phantom Thieves on both sides, the SteelBook case will definitely keep your games safe from those trying to ‘take your heart,’” read the Atlus marketing. On September 1 I ordered it from Amazon. As a general rule I try not to pre-order games, but collector’s editions have a tendency to sell out. The price for it there had dropped from $90 down to $76.49. Amazon took off another $4.50 thanks to my Prime membership. At barely $10 more than the base price of the game, it felt like a steal. Seven months later on April 4, 2017, I came home from work to see the package sitting on my doorstep. I still remember feeling elated when I began opening it up on my bed. The collectible box everything came in was plastered with the game’s beautiful, vibrant art. The high was short-lived. The bag was small and cheap. The 4” plush was, well, a 4” plush. I tossed it to my cat. She didn’t blink. The soundtrack CD was a nice idea but I didn’t have a CD player (The PS4 is the first PlayStation not to support the format). The pages of the artbook were thin, full of white space, and light on descriptions or background insights into the game and its creation. The SteelBook was nice, at least, a fine addition to the nondescript shelf of PS4 games hidden deep within my TV stand. The ghost of my childhood that had leapt at the sight of a giant box with gorgeous anime characters evaporated. I bundled up everything but the game and threw it all in the closet. I played Persona 5 for close to 20 hours in the weeks to come but never felt entranced. I knew it was great but didn’t feel it in my bones, SteelBook case or no. Two years later, I still have it. I’ve moved and put it in a new closet. I should probably get around to finding it a new home.